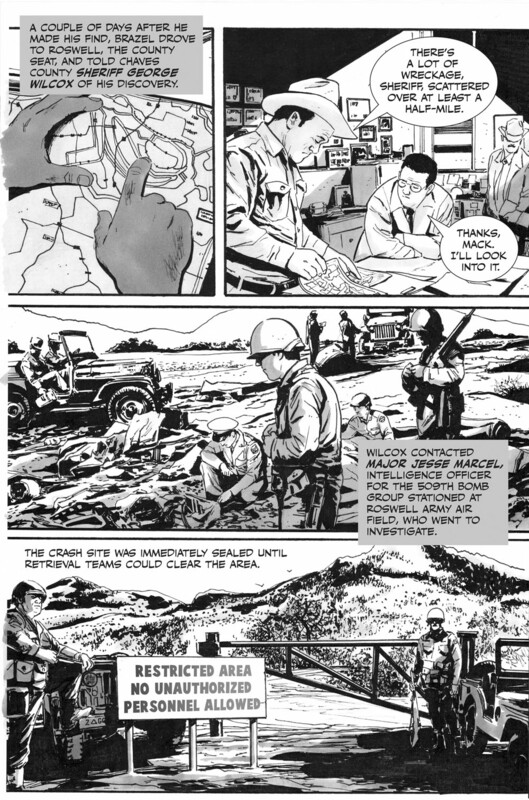 AREA 51: The Graphic History of America’s Most Secret Military Installation | Z-File, Inc. Though nearly everyone has heard of it, almost no one has known anything about it . . . until now. Located in the remote Nevada desert near the dry bed of Groom Lake, Area 51 is the most famous military installation in the world that doesn’t “officially” exist. In Area 51, author Dwight Zimmerman and artist Greg Scott unravel the real history – minus the aliens and sci-fi movie plots – revealing in detail how for more than 60 years, the CIA, the U.S. Air Force, and aerospace company Lockheed Martin have all used Area 51 as a staging ground for test flights of experimental or highly classified aircrafts. 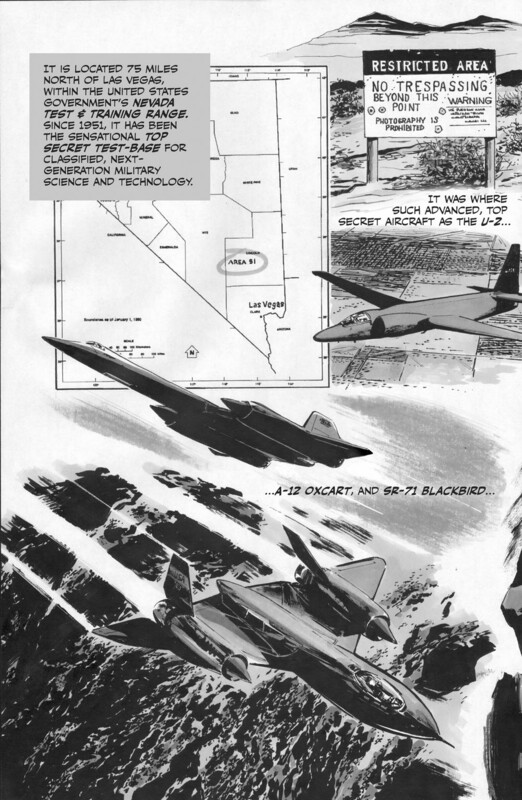 Scott illustrates the Archangel-12 as well as follow-on aircrafts, such as the U-2, the SR-71 Blackbird, and the F-117 Nighthawk stealth fighter, while author Zimmerman tells the history of how they sprang from the research and development conducted at Area 51. 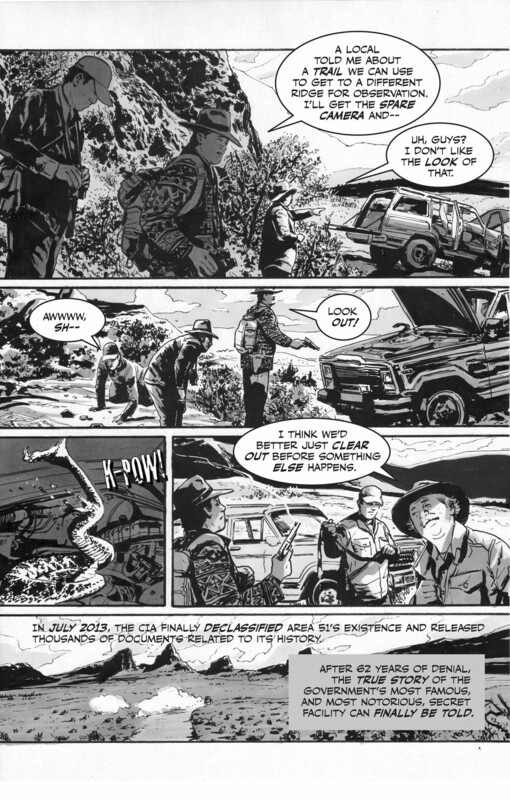 This first-of-its-kind graphic history strips away the fantastical aspects of this mysterious location and establishes the actual, significant history made there. 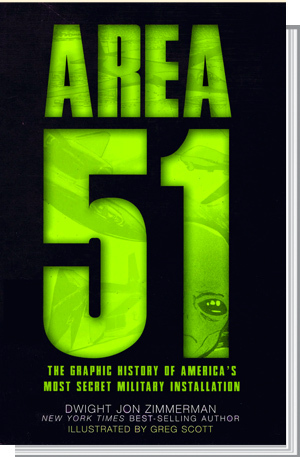 Dwight Zimmerman has done an outstanding job tracking the history of one of the most intriguing enigmas of our age–the ultra secret and ever mysterious “Area 51.” The graphic novel is absolutely perfect for a serious disposition on a topic that has generated so much controversy. 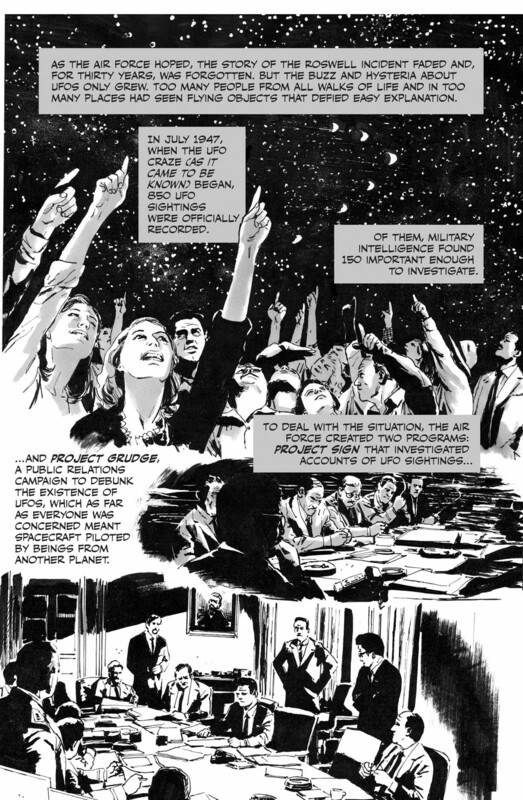 The drawings truly help the reader visualize the importance of Area 51 and go a long way toward helping debunk the many myths surrounding this fascinating place. Conspiracy theorists will not likely embrace this book, but anyone who wants a serious, scholarly, accurate picture–an entire set of pictures, in fact!–of what Area 51 has been about will be very happy to have this material in hand. Dwight’s writing is crisp, fast-paced, entertaining and-above all-accurate. The story of Area 51 finally has a complete and factual telling. Amazingly, the truth is, indeed, stranger (and more tantalizing) than the fiction that has previously surrounded this out-of-bounds desert enclave. This is NOT just a book for young people–this is a serious, information-packed illustrated book. Amazing and entertaining; it debunks lots of rumors and misinformation about Area 51. I am impressed with all that it delivers. Not “just a comic book,” it resonates with adults as much as it should with younger readers. A great read! & The Military Writers Society of America Author. Zimmerman packs a ton of information into a book that helps explain and understand one of America’s worst kept secrets about one of it most vital technological national assets. 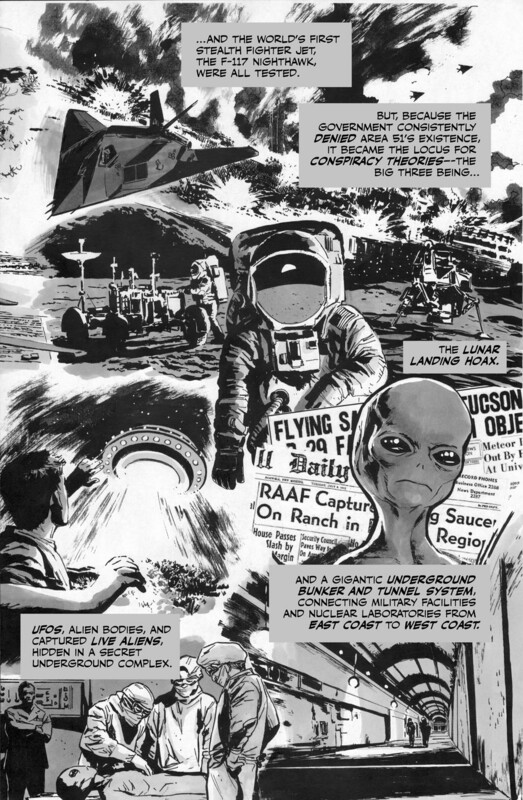 Area 51, while “Black” for years, has been the focus of crazy legends and conspiracies and Zimmerman helps demystify the legends and put things in perspective in a unique, highly readable format. A “must read” for those interested in Cold War history and future aerospace technology development. Colonel, USAF, (ret) Special Agent, Air Force Office of Special Investigations (Retired) Former Director of Security and Special Program Oversight, USAF. 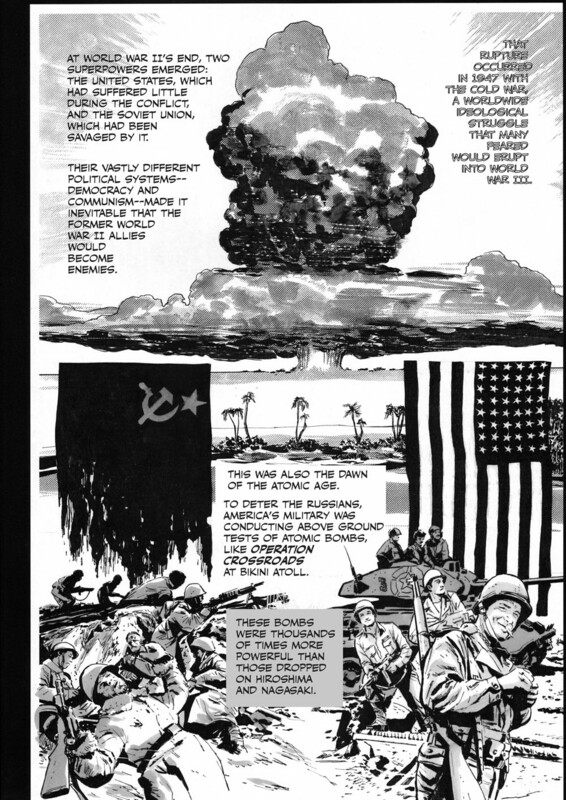 Much like all of the other books from the Zenith Press line, this graphic novel is a great way to get anyone up to date on another interesting aspect of history. I keep these books on my shelves in my classroom. So, what did happen at Area 51? And what is Area 51, anyway? That’s the thing. It’s been so shrouded in secrecy that it became this unknowable unknown, as Donald Rumsfeld might have put it. Okay, so now we have a lot of knowable knowns to work with since the CIA finally declassified Area 51’s existence in 2013 and released thousands of documents related to its history. Dwight Jon Zimmerman assembles facts in a very accessible manner. And Greg Scott provides lean and tidy artwork that evokes a sense of intrigue and urgency. He’s one of my favorite artists. 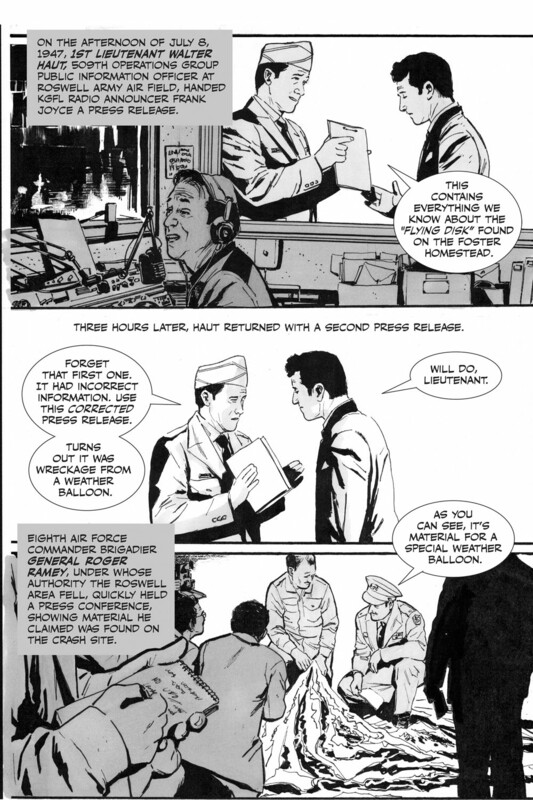 I really enjoyed his work in the sci-fi thriller graphic novel, Strange Attractors. 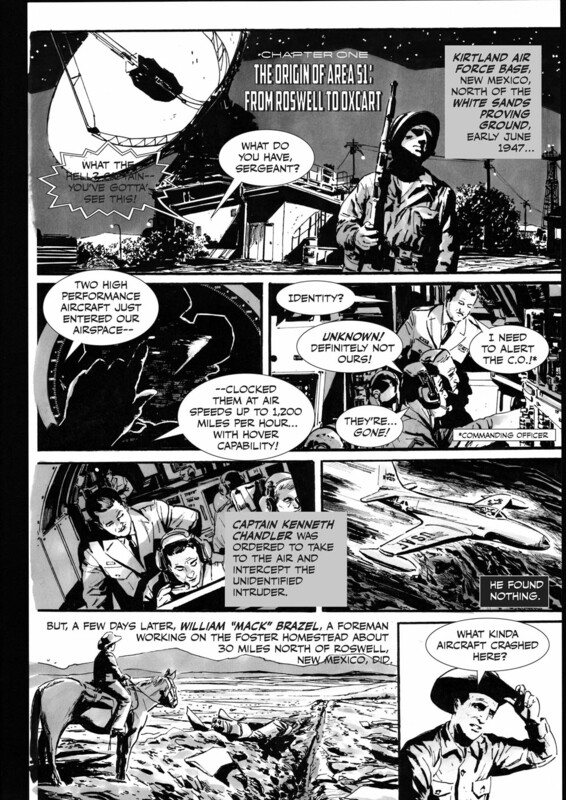 Zimmerman’s rendition of the Area 51 story is a walk down memory lane for this former USAF insider. It superbly captures the history, mystery and folklore of one of America’s best-kept secrets. Riveting, accurate, and thought-provoking for anyone with – and even those without – a Need-to-Know! Put on your cloak and dagger and enter the shadowy, hush-hush caverns of a secret world where the government is hiding stuff from you. You may know a little about clandestine activity in Area 51, but the whole story has never before been blown open like this. Only the graphic history format and only author Dwight Jon Zimmerman and artist Greg Scott, after a lot of delving and detective work, could make this story shine as brilliantly as it does here. I could tell you more but I’d have to kill you. author of Fighting Hitler’s Jets. With this book, Zimmerman (Uncommon Valor; The Vietnam War: A Graphic History) pulls back the curtain to reveal the true story of this cutting-edge aerospace research and testing complex. Spy planes flying on the edge of outer space, radar-defeating stealth technology, and even today’s deadly strike drones can all trace their origins to Area 51 and the teams of designers, engineers, and pilots who served there through decades of total secrecy. Apart from a few brief asides, little mention is made of the facility’s role as the Shangri-la of UFOlogists, and the well-known conspiracy theories regarding the facility are ignored, much less refuted. Scott’s illustrations do a fine job of conveying the seriousness and tension that permeated every aspect of the base’s many projects . . . enjoy the fascinating true-life tales of espionage, diplomacy, and high-tech aerospace innovation. Recommended for Cold War history buffs and aviation aficionados.